Shareholders are being fleeced by bureaucrats. They need to take the power back, says Banker's Umbrella. The vexed debate about executive pay is a perennially popular one. Those who support large salaries for senior managers very often base their rationale on the argument that executives should not be penalised for their ‘talent’. It is the finance sector, and senior bankers in particular, who have been the biggest proponents of this ‘talent’ argument. No surprise then that it is also those in finance who have been the biggest recipients of excessive pay packets. The very word talent irks me, simply because it implies that these super executives popped out of their mother’s womb talking about KPIs, synergies and congruent corporate strategies. They didn’t. Can we agree that the corporate executives actually learned something during their career and use the term ‘skill’ instead of talent? So the question remains: are these skilled executives really deserving of their large pay packets? Well the answer to that question is plain enough. No, no they aren’t. Thanks to a wealth of academic study into the subject the findings are pretty clear: there is no relationship between executive pay and the performance of a firm. If you like pretty graphs then Global Governance Advisors (GGA) developed a tool that analyses the correlation between CEO pay and performance in the US based on several indicators. Just have a look at the findings. It’s a great little toy. Or you might want to peruse the research conducted by the European Consumer Staples team at RBC Capital Markets, which found ‘minimal correlation between remuneration and long term share price performance’. Meanwhile, a recent UK study found ‘attempts to link the pay of Britain’s leading company executives to their company’s performance are not working’. The general consensus of research into the subject is clear. Executive pay has nothing - yes that’s right, nothing - to do with a company’s performance. Despite all this evidence there remains a common belief that corporate executives are leaders who create and build value. This belief is a myth. Executives are administrators not leaders. The real job of senior management is to sustain the business, not to grow the business. Growing a business demands leadership and taking risks. Sustaining one demands controlling them. If big corporations were really interested in growing their business instead of sustaining it, they would all be hiring people who have experience in building businesses from the ground up. Instead, more often than not, hiring is done either in-house or from the senior management of other large corporations. There’s nothing wrong with this - every large organisation needs its administrators. But administrators are not risk takers. When you take risks and they pay off you deserve the rewards that go with it - bonuses, huge pay, chauffeured cars, perks and the like. When your job is to control risk and keep the status quo, there is no basis for excessive pay. Yes, senior executives carry a lot of responsibility and that responsibility deserves to be rewarded. But they are being paid on average 84 times more than the average worker in the UK and 354 more in the US. How does that serve shareholders? The problem with putting so much money into keeping the status quo is twofold. Firstly, money that should be used to actually grow the business and create value (i.e. what shareholders want) is being used on wages for bureaucrats. Secondly, and most importantly, the problem with keeping the status quo is that for the world at large the only constant is change. The statistics on this are profound: of the companies that were in the Fortune 500 in 1955, only 13% remain. According to Professor Richard Foster from Yale University a company on the S&P 500 Index is being replaced once every two weeks. In 1958 the average time a firm spent on the S&P 500 Index was 61 years. Today it is down to 15. The trend in increased executive pay has not brought corporate longevity, business growth or increased shareholder value. What it has brought with it is a coup d'état - the bureaucrats have taken power from the owners and are busy siphoning off the corporate coffers into their own pockets. Shareholders of the world need to unite and take the power back. 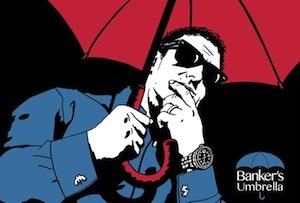 Banker's Umbrella is the world's most popular private banking blog. Catch it on Twitter @BankersUmbrella.